In October 2013, we were invited to participate in Absolut Originality, a multi disciplinary exhibition curated by Aisling Farinella for the launch of the Absolut Originality bottle. We collaborated with illustrator Chrissie Abbott, film-maker Jamie Delaney, stylist/creative director Aisling Farinella and fashion designer Danielle Romeril to create two pieces which combined the work of everyone involved. For the projection mapping piece we took an illustration by Chrissie Abbott which was hand-drawn on to the wall of the venue. Over this we layered some of Jamie's footage from a piece he shot incorporating Danielle’s Design. We then added our own 2d and 3d animation which was influenced by Danielle’s work and the Cobalt blue of the bottle. 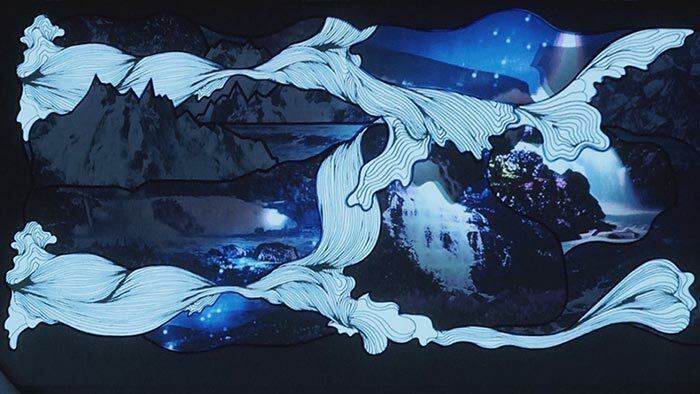 For the second installation we worked with iamtomodea.com to create an interactive projection mapped dress on a piece created by Danielle. The patterns and textures we used were based on Jamie's film work and Chrissie’s illustration. Visitors to the space were invited to augment and remix the patterns by gesturing there hands over a motion sensor. Each creation was then assigned an individual number and projected on to the wall of the venue, with more unique creations added every day.